LAHORE: (Wednesday, December 5, 2018): Punjab Minister for Special Education Mr Chaudhry Muhammad Akhlaq has said that disability is not weakness rather we must benefit from the strengths of special persons for development of our country. 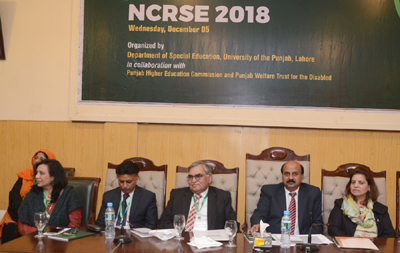 He was addressing a national conference on research in special education organized by Punjab University Department of Special Education in collaboration with Punjab Higher Education Commission and Punjab Welfare Trust for the Disabled at Al-Raazi Hall here on Wednesday. Dean Faculty of Economics and Management Sciences Prof Dr Nasira Jabeen, Chairman Akhuwat Foundation Dr Amjad Saqib, Dean Faculty of Education Prof Dr Mumtaz Akhter, Incharge Department of Special Education Dr Humara Bano, Dr Abdul Hameed from UMT, Director PWTD Dr Izhar Hashmi, faculty members and a large number of students were present on the occasion. Addressing the conference, Mr Akhlaq said that we must serve persons with disabilities as it was our moral, national and religious duty. He said that the government had given special attention to special persons in 100 days for their development. He said that the government would establish new institutions for special persons and would also strengthen previous programs and provide more facilities for their welfare. He said that as many as 292 institutions were working for special children while 14 special education centres had been established with an amount of Rs 546 millsion. 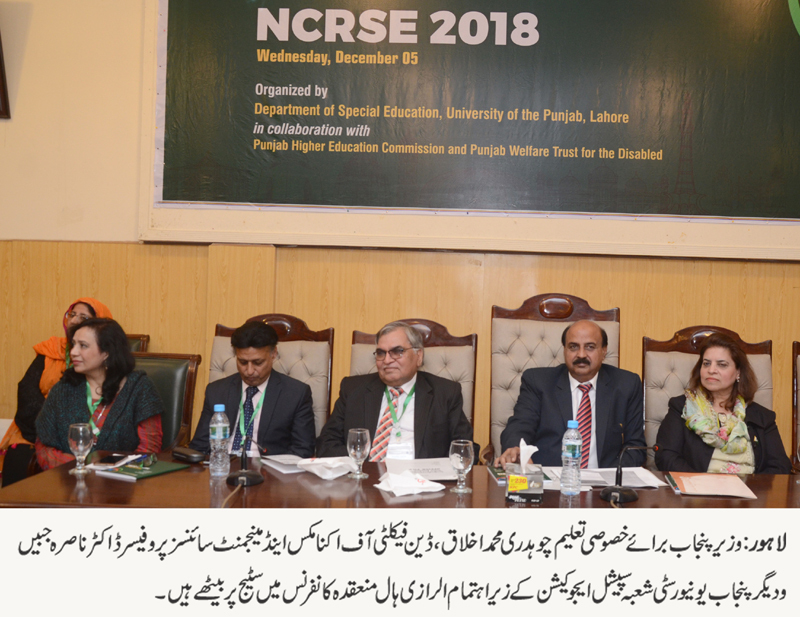 Moreover, he said, special education institutes set up at Rahim Yar Khan, Sargodha and Vehari had been upgraded to middle school level. He said that the government would also provide 35 new busses to 19 special institutions and a grant of Rs 200 million had been allocated in this regard. He said that we must make special persons able to handle their everyday matters amicably. He lauded PU Department of Special Education for providing training to teachers imparting special education. Almost 77 speakers in their recommendations stressed the need to empower the persons with different abilities through inclusion and trainings.